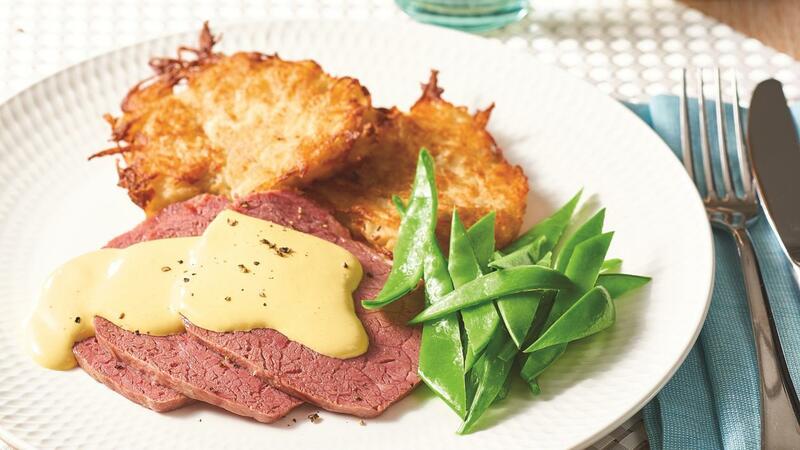 Still a favourite in aged care, a classic corned beef is given a modern twist by serving it with a delicious creamy mustard sauce and crispy potato hash. Cover the corned beef in a large pot with water. Add onion, cloves and vinegar, cook for 2 - 3 hours. Bring water to the boil and add butter. Remove from heat and whisk in KNORR Instant Mashed Potato Mix. Peel and grate the potato and add to the mash. Preheat the oven to 160C. Place individual portions onto a large oven tray sprayed with Real Ease Cooking Spray and cook until golden. Turn potato over half way during the cooking process so it turns golden on both sides. Combine COLMAN’S Original English Mustard and KNORR Garde d’Or Hollandaise Sauce. Heat and serve with the meat. Serve with fresh steamed snow peas.